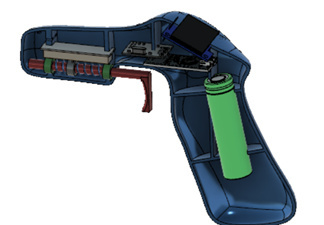 We have spent the last months building, designing and programing several controller units. And have some info we want to share. We all need some way of controlling the E-foil. As we see it we have two options that work, a wireless remote or a wired remote. Battery indicator for board and controller. no extra battery required . The remote can be smaller. you don’t lose the remote. How to transmit data. From remote to board? Hall effect switches/sensors: they have no moving parts, which gives them long life. But they are also quite sensitive to noise, /magnetic fields etc… . I have had some issues with the Thumbweel switch I ordered from RS components, 1. It’s not waterproof did not fulfill its ip67 requirements ( you have to modify it) 2. Some drift in the data it outputs, 3. Sensitive to noise. 4. A bit to short travel to be comfortable to use (too sensitive). 5. Expensive. But overall it works ok, but not perfect. Biggest advantage with this switch is that it has return springs and is waterproof when modified. They have a very stable signal! There are MANY different types, but they can be a bit troublesome to make waterproof. But with a shaft seal it’s not that hard. I will make one with a potentiometer it will be more stable. And I can get a longer travel on the trigger to make it easier to use. Biggest advantage stable signal, cheap, easily customizable. Pressure sensitive resistors: not yet tested but a friend of mine said they were quite reliable. Any one tested them yet? this i V2 or somting not yet built but uses sliding potentiometer. will post more soon, I am tired of writing. 9V UBEC is killing the receiver? hi, i’m working on an e-foil too with one nuance: i need my remote to communicate through water. i tried 2gHz: no luck, 75MHz : the technology is too old and too big to repackage. i finally landed on custom made 433 MHz. Instead of using a potentiometer that requires waterproofing, i’m now using linear Hall effect sensors and some magnets… It works great! I seem to be well. Can you tell use more about the linear hall effect and magnet! Where have you buy it? i got them from mouser electronics. i tried both SS496A1 and SS495A1, the only difference is the strength of the magnetic field needed. Magnets are from a hobby store. 9v battery instead of 5v to improve range. I’ll release all the drawings, program and part list once i start flying ! So you got your hall sensor completely in your waterproof case and just the Magnet touching the water and the magnetic field of it walking through the wall of the case right? I think this setup is grate! You get the leaver action you want, long travel, and very simple to make waterproof. The signal is also very stable and good. I think it is because the magnetic field between two magnets are quite homogenic and not as easily interfered. the video is a bit dark so I added a crude CAD drawing, to show how the test was conducted. Now I can’t wait to make a new improved remote! It might also be plausible that Lift foils uses this principle? cheers! will post new remote soon. Nice work Hiorth. Linear hall effect sensors look good. Are you ready into a arduino or similar micro and sending via bluetooth to another on the board which generates PWM for ESC? I’m also building my own, I have an idea to build in a launch/learner control function, i.e full squeeze of trigger when starting and micro can control a fixed speed (which we set), this would help with jerky control when trying to learn. Obviously need to know the required speed etc. that is optimum. yes sending via bluetooth and using PWM signal. testing slow acceleration, the videos show a linear acceleration curve. Pressing the button while holding the throttle in. the motor goes from no speed to full speed, the acceleration and deacceleration can easily be changed. added safety feature the button must be pressed for the throttle to work. you can also use cheap RF modules … very, very cheap (5$ for transmitter and receiver). on mine i’m just counting time between signal received… to avoid shutting down for small signal lost, it wait 1 second and then put the ESC at neutral. From what i read i think it’s also less regulated, 433mhz or 315 have restriction in some countries. But if you want to transmit through water, you need to go down in frequency … 2.4ghz get too much attenuated. Hi guys. Working also on a remote and thought I would share our approach (although we are in early stages and no CAD drawings yet). Adafruit Mini Analog Joystick - 10K Potentiometers (https://www.adafruit.com/product/3102) it has a waterproof jacket which is nice. ESP8266 for coms (that’s 2.4Ghz wifi) I am thing the Feather board which can be battery powered. The ESP can also be configured just like any Arduino that’s nice. It can talk over I2C to other IC’s. ADC from TI to read the joystick potentiometer. I got a cheap one via Alibaba 200amp label: ‘Mystery’. It has a 3wire interface but I have no idea how I can communicate with this thing? That’s it quite early stage still waiting from some parts to arrive but will keep you poster as I make progress. 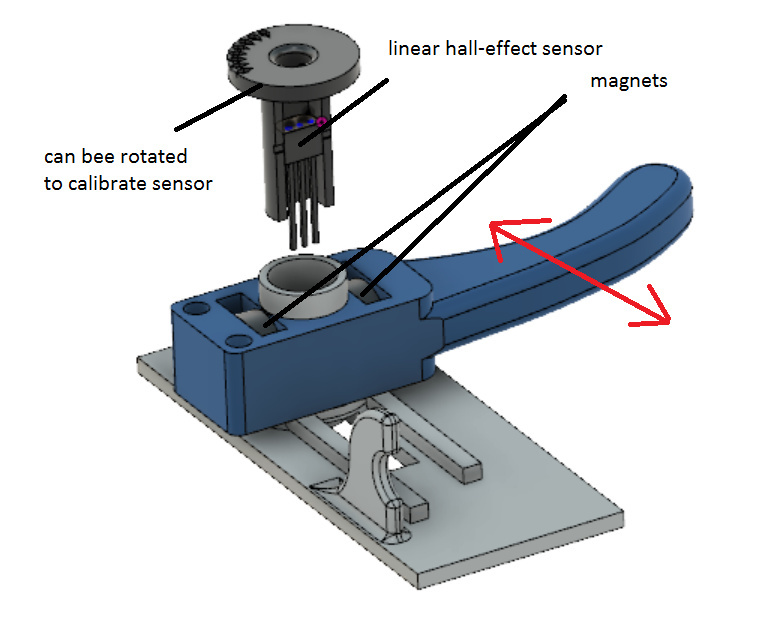 I like the idea of magnet with Hall sensor I think that is a nice workaround to avoid complicated water seals. you communicate with ESCs the same way as you do with servomotors. there’s a dedicated arduino library for that called "servo"
the 3 wires are: ground and +5v (handy to power the arduino) and the signal wire (usually white) where you send the command. WOW didn’t realize this forum was going to blow up that way. Mat, looks like I’m not the only one with that hall effect sensor idea. It is what Lift did(https://www.liftfoils.com/pages/e-foil-launch). I have a couple on hand right now but buying a few different ones. Im really liking that SS495A. Being high volt input, could allow more resolution. Not sure exactly but cant wait to try it. Im using two Nanos with two nRF24L01. Programmed them for one to be the transmitter and one to be the receiver. 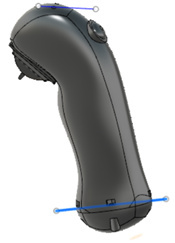 Going to be tough to 3d model this unit with a trigger but have some experience with Fusion 360. And a CNC to cut parts. Hoping in the end a good sealing 3d printed model. Here was just the beginning of my project.